The Buddhist temple on Mount Takao is formally known as Takao-san Yakuo-in Yuki-ji, and most commonly as Yakuo-in. It was established in 744 on the orders of Emperor Shomu as a base for Buddhism in eastern Japan and its founder was Gyoki, a charismatic priest closely associated with the erection of the Great Buddha at Todai-ji Temple in Nara. Yakuo-in was restored late in the 14th century by Shungen Daitoku, a priest from Mount Daigo in Kyoto, one of the most sacred sites of Shingon esoteric Buddhism, with close connections also to Shugendo (mountain asceticism). He performed a very demanding goma fire ritual dedicated to the deity Fudo Myo-o (Immovable King), burning 8,000 goma sticks, and he subsequently received a living vision of the deity Izuna Daigongen and enshrined this deity as the principal image. Shungen Daitoku is as a result often described as the second founder. 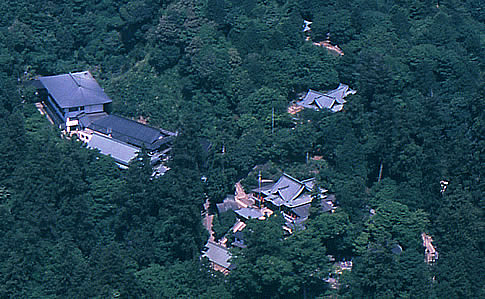 Through his efforts, Yakuo-in became connected to the Shingon esoteric Buddhism and Mount Takao flourished as a Shugendo center. During the civil war period that lasted from the late 15th to the late 16th century, a number of powerful warrior lords, such as Takeda Shingen and Uesugi Kenshin, looked to Izuna Daigongen as a protector deity. The Hojo family, who held the Kanto region under their sway, were particularly strong devotees and they placed Mount Takao under their special protection. It was no accident either that the mountain occupied an important strategic position. During the Edo period (1603–1867), Yakuo-in expanded under the patronage of the ruling Tokugawa family. Today Yakuo-in is one of the three head temples of the Shingon-shu Chisan-ha Sect, the others being Narita-san Shinsho-ji and Kawasaki Daishi Heiken-ji. Shungen Daitoku enshrined Izuna Daigongen at Yakuo-in as the principal image. Izuna Daigongen is a form in which Fudo Myo-o appears to bring people to salvation. 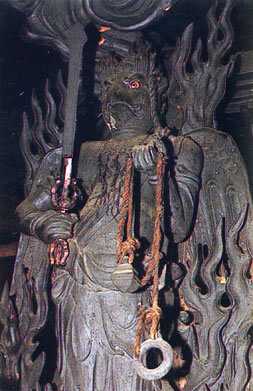 The angry-faced Fudo Myo-o is in turn an avatar of the Dainichi Nyorai (Buddha of Cosmic Life). The Izuna cult had begun at Mount Izuna in present-day Nagano Prefecture in the Heian period (794–1185), and eventually it spread to shrines throughout the land. Izuna Daigongen combines the elements of five deities: Fudo Myo-o, Karuraten (Garuda, a divine bird), Dakiniten (a demon that feeds on human hearts), Kangiten (a fertility deity with the head of an elephant) and Benzaiten (the deity of water, music and victory in battle). Izuna Daigongen protects devotees from harm and brings them happiness and security in their daily lives. Tengu, long-nosed demon-like beings, are believed to dwell on sacred mountains acting as the messengers of the deities and buddhas to chastise evildoers and protect the good. They are often depicted holding a uchiwa (Japanese fan), that sweeps away misfortune and brings about good fortune. Mount Takao is closely associated with devotion to tengu. Two figures standing in front of the Izuna Gongen-do Hall exemplify the two types of tengu. The smaller tengu is depicted with a beak of crow, while the larger one has a big nose. 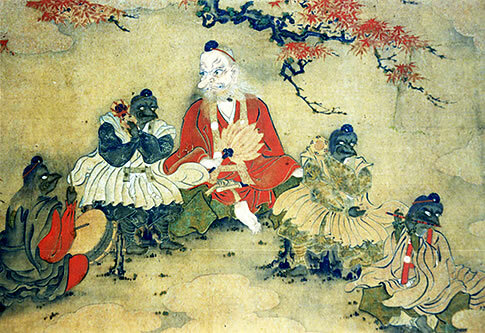 The small tengu is considered to be still undergoing religious training, while the large tengu is often likened to an experienced yamabushi who has attained spiritual power through religious training at Mount Takao.